Etiquette is an essential element of society, as it reveals the characteristics of each individual. Although people think that they are behaving well and always practicing the right manners, there are still ongoing issues on the subways. This thesis desires to aid people in becoming aware of existing etiquette issues and to change their manners in a productive way. The goal of this project is to emphasize the importance of etiquette, to increase the awareness of etiquette, and to give people motivation to practice etiquette. The application, EE, is a smartphone prototype game that allows people to play with their Facebook or phone contact friends. EE approaches people in simple, humorous, and interactive ways. When users follow etiquette in subways, they can get scores by adding icons, which describe the ten basic principles of etiquette in subways. They are able to see their rank among their friends. In addition, anyone who has this application will have a chance of winning a random free ride. The goal of this application is to help people recognize the ten basic principles of etiquette, realize the importance of following etiquette and be motivated. Etiquette is an essential element of society, as it reveals the characteristics of each individual. Although people think that they are behaving well and always practicing the right manners, there are still ongoing issues on the subways. This thesis desires to aid people in becoming aware of existing etiquette issues and to change their manners in a productive way. The goal of this project is to emphasize the importance of etiquette, to increase the awareness of etiquette, and to give people motivation to practice etiquette. 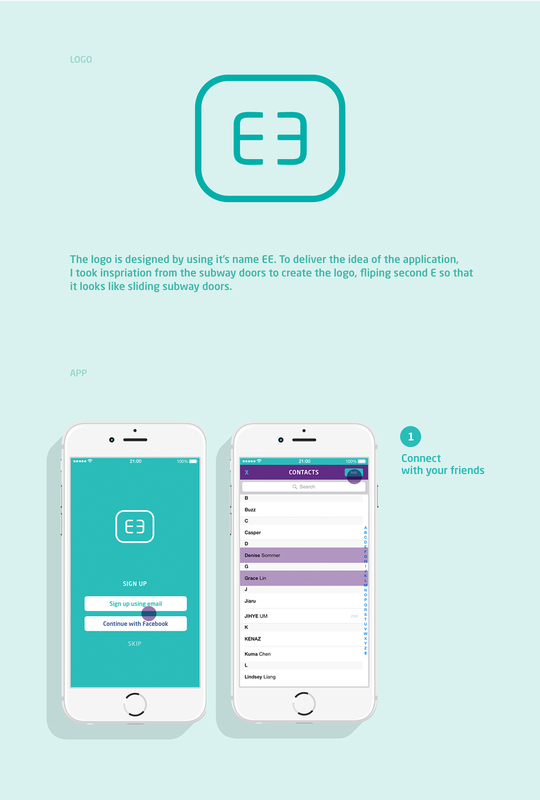 The application, EE, is a smartphone prototype game that allows people to play with their Facebook or phone contact friends. EE approaches people in simple, humorous, and interactive ways. When users follow etiquette in subways, they can get scores by adding icons, which describe the ten basic principles of etiquette in subways. They are able to see their rank among their friends. In addition, anyone who has this application will have a chance of winning a random free ride. The goal of this application is to help people recognize the ten basic principles of etiquette, realize the importance of following etiquette and be motivated.